Today is the opening of Dreamforce – this year’s grandest ever annual event bySalesforce.com. Marissa Mayer, Sheryl Sandberg, Marc Benioff, Vivek Kundra, Wayne Dyer, and many more will appear at the Moscone Center and some of San Francisco’s largest hotels as the event takes over the town. And now you can add one more item to the agenda – the release of the Salesforce.com App for Trust-based Selling. As the author of Trust-based Selling, I couldn’t be more proud to see it join the company of major sales books like Miller Heiman, SPIN Selling and others with their own Salesforce apps. All thanks go to my developer partners, Soliant Consulting. I’ve worked with them for years, and they’re top-notch; as part of their database applications work, they build complex custom applications built on Salesforce. Trust-based Selling is based on the simple idea that buyers greatly prefer to do business with those they trust. 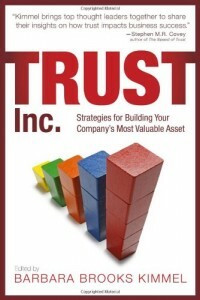 Trust can be broken down and taught through the Trust Equation and trust principles, as described both in the book and in the app. But it only works for those who grasp its basic premise – that you actually have to care about your customer. The Trust-based Selling Salesforce App brings those concepts to life on the tried and true Salesforce platform. If you’re at Dreamforce this week, look up the team from Soliant to ask them more about the Trust-based Selling App, starting with MD Craig Stabler. And enjoy the event.